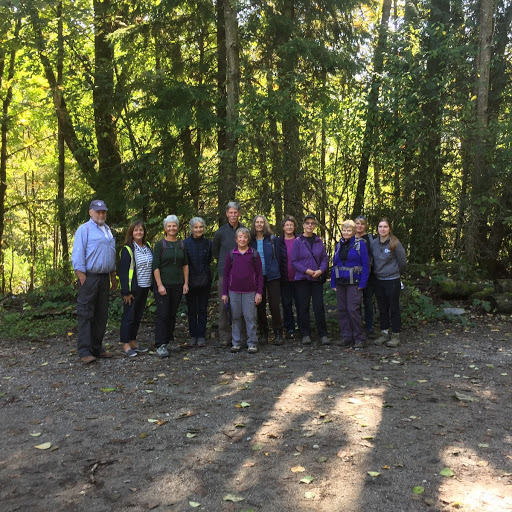 We met at Bridgman Park adjoining Lynn Creek, and after a brief introduction by ZoAnn and Glen, walked about 2 km along Lynn Creek to a bridge spanning the mainstem. The mouth of the stream was across the bridge. The mainstem was running very fast but the stream was dramatically different: slower, quiet and peaceful. Several previous rain-free days had lowered the water levels, giving us perfect views of the restoration structures and the streambed. We walked about 150 metres along its shoreline, viewing 4-5 structures of large woody debris and large boulders. 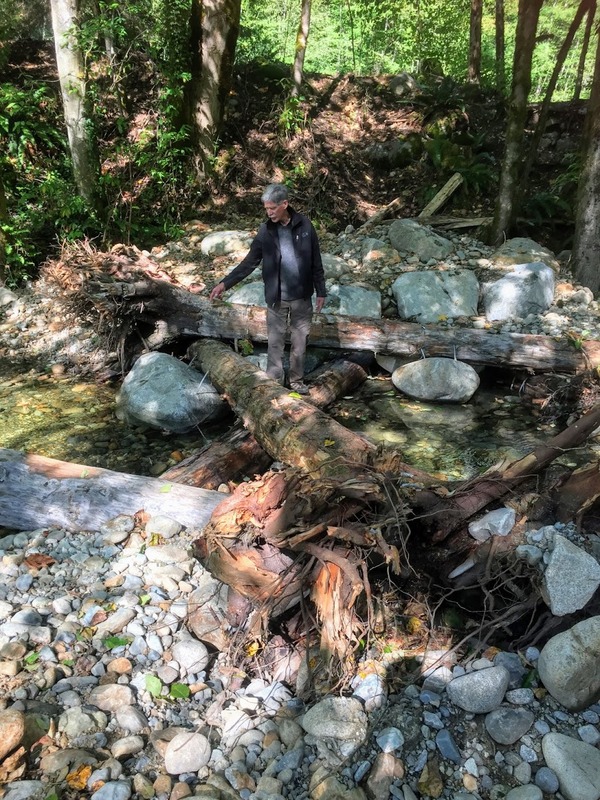 Glen and ZoAnn explained how the designs had developed, how the structures had been obtained, arranged and placed, and how they could increase habitat diversity, which is a critical component of stream design. Ingredients of diversity include riffles, pools, current flow, hiding places, gravel size, streamside plant cover, overhead cover (for shade and insect fall), so that restoration is as much art as science! 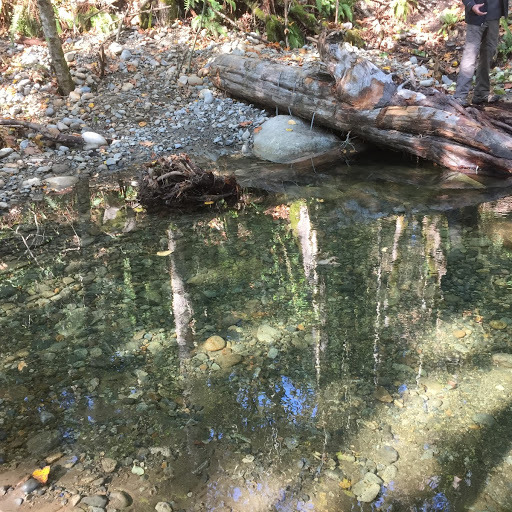 Five of our six salmon species (pink, chum, coho, chinook, steelhead) spawn in the stream, each with different gravel requirements, and the young of some species use it as a quiet backwater for overwintering. As storms become more frequent and severe, backwater channels like this one will become increasingly important. For stream enhancement and restoration projects to succeed, collaboration and cooperation with agencies, politicians, industries and individuals is essential. In this case, partners included FOC, the City and District of North Vancouver (DNV), the River Institute, BCIT, the Tseil-Waututh Nation, construction workers from a nearby road and bridge project (they diverted and directed traffic during the building phase), several industries that contributed raw materials, heavy machinery and operators, and of course individuals with various skill sets. One of the happiest results of the walk was seeing first-hand what could be accomplished by people working together because they shared common values: the importance of natural habitat and ecosystem health. A wonderful walk, definitely worth repeating. Streamkeepers began in 1993 as an initiative of Fisheries and Oceans Canada (FOC), designed to encourage communities to form local groups to care for and enhance local streams and streamside habitat. 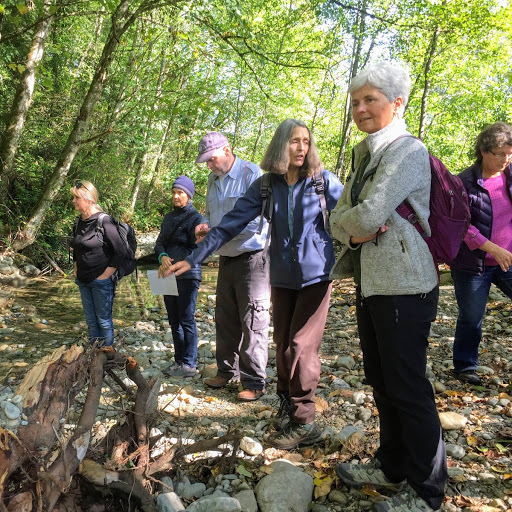 Members are trained to enhance and restore streams and streamside habitat with the help of FOC advisors and professionals in fields such as hydrology and engineering. For information on training, see http://www.pskf.ca/program/program.html. For North Shore Streamkeepers, see www.nssk.ca. NSSK posts volunteer opportunities on their message board – http://www.nssk.ca/what-we-do/messageboard/. Overhanging streamside vegetation is vital, providing shade, protection from predators, and insect fall from leaves (particularly important food for young fishes).